Akil, O., Oursler, A. E., Fan, K. and Lustig, L. R. (2016). Mouse Auditory Brainstem Response Testing. Bio-protocol 6(6): e1768. DOI: 10.21769/BioProtoc.1768. Akil, O., Sun, Y., Vijayakumar, S., Zhang, W., Ku, T., Lee, C. K., Jones, S., Grabowski, G. A. and Lustig, L. R. (2015). Spiral ganglion degeneration and hearing loss as a consequence of satellite cell death in saposin B-deficient mice. J Neurosci 35(7): 3263-3275. The auditory brainstem response (ABR) test provides information about the inner ear (cochlea) and the central pathways for hearing. The ABR reflects the electrical responses of both the cochlear ganglion neurons and the nuclei of the central auditory pathway to sound stimulation (Zhou et al., 2006; Burkard et al., 2007). The ABR contains 5 identifiable wave forms, labeled as I-V. Wave I represents the summated response from the spiral ganglion and auditory nerve while waves II-V represent responses from the ascending auditory pathway. The ABR is recorded via electrodes placed on the scalp of an anesthetized animal. ABR thresholds refer to the lowest sound pressure level (SPL) that can generate identifiable electrical response waves. This protocol describes the process of measuring the ABR of small rodents (mouse, rat, guinea pig, etc. 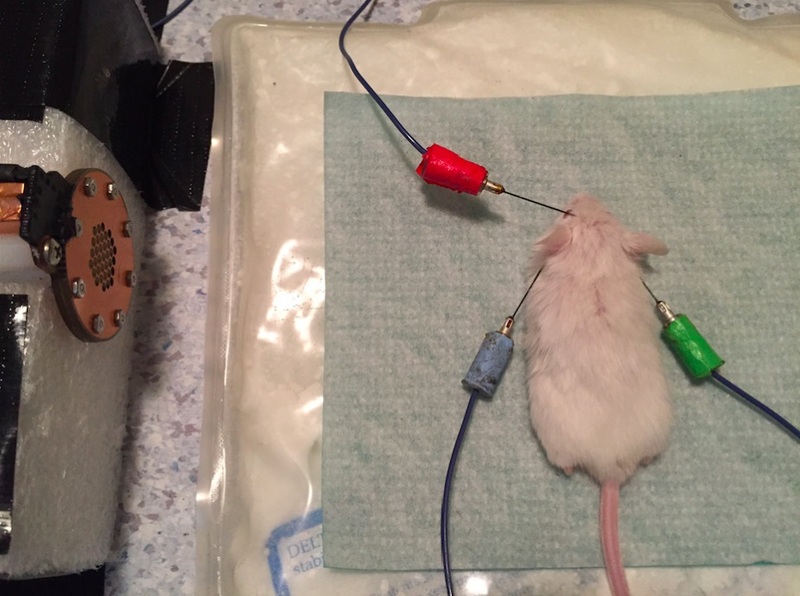 ), including anesthetizing the mouse, placing the electrodes on the scalp, recording click and tone burst stimuli and reading the obtained waveforms for ABR threshold values. As technology continues to evolve, ABR will likely provide more qualitative and quantitative information regarding the function of the auditory nerve and brainstem pathways involved in hearing. All procedures and animal handling described in this protocol should be done according to approved national ethical guidelines and complied with all protocol requirements of the Institutional Animal Care and Use Committee. Appropriate site-specific IACUC approvals are required to perform the following procedures. The onset of hearing in mice is around postnatal day 12 (P12), so the hearing test can be performed on mouse older than P12. The FVB mouse strain was used in this protocol, but any mouse strain can be used with this protocol. The animal is anesthetized with an intraperitoneal injection of a mixture of ketamine hydrochloride (Ketaset 100 mg/kg) and xylazine hydrochloride (Xyla-Ject 10 mg/kg) using the 1 ml insulin syringe with the precision glide needle. When working with mice, gloves and lab coat should be worn at all times. Additionally, for less experienced users, a heavy glove may be worn when injecting older mice to protect from biting. It is advised to use only ketamine and xylazine solution for anesthesia when testing hearing because this drug combination provides stable ABR thresholds. After injection the animal is placed in an isolated clean and warm cage (~37 °C) using an electric heating pad or other hearing device. Note: No other awake animals should be with an anesthetized mouse. The mouse will be ready for testing within ~2-5 min. Appropriate levels of anesthesia can be tested with a stimulus such as a toe pinch. Place the mouse on a preheated non-electric heating pad (~37 °C) in a soundproof chamber. Monitor the body temperature with a rectal probe throughout recording. Cover the animal's eyes with a protective ophthalmic ointment to keep the eyes moist during anesthesia. This will also suppress the animal's blink reflex, which can add noise to the recording. Position the mouse so the speaker is placed 10 cm from its left ear. Speakers for this setup were calibrated using an ACO Pacific 7017 microphone. The center of the speaker has to be aligned with the external auditory canal. For hearing threshold evaluation, 3 subdermal electrodes were used: Ground, reference, and active electrode, are placed 2-3 mm under the skin of the mouse head (Figures 1-2). Insert the active electrode subdermally at the forehead (Figure 1 and Figure 2: Red). Note: Use clean forceps to lift and tense the skin. Insert the reference electrode below the pinna of the left ear (Figure 1 and Figure 2: Blue), and the ground electrode below the contralateral (right) ear (Figure 1 and Figure 2: Green). Note: Figure 1 shows a picture of the mouse in position of recording with all 3 electrodes placed on the head in the sound-proof chamber and Figure 2 shows the exact position of the electrodes. Figure 1. A mouse in position for ABR recording. The mouse is placed 10 cm from the speaker on a heating pad with all 3 electrodes placed in the head, within the sound-proof chamber. Figure 2. Position of the 3 electrodes on the mouse head. The blue, the green and the red arrows represent the exact position of the electrodes in the mouse head. A picture of the blue electrode is also included. “F” means forehead, “R” means right ear and “L” means left ear. Check the impedance: If the impedance is over 5 Ohm, adjust the electrodes in the scalp and retake the measurement. Continue to manipulate the electrodes until the impedance drops below 5 Ohm. Sounds are presented and ABRs are recorded in a free field condition as previously described (Akil et al., 2015; Akil et al., 2012; Akil et al., 2006). Note: To measure each ear separately, as opposed to a sound free field ABR, a tube with an ear tip can be run from the speaker to the ear canal directly (close field), and the process above repeated. TDT software (BioSig III) and hardware (RP and TD speakers) are used for ABR recording. TDT BioSigIII system, produces and records stimuli for 20 ms duration and 31 Hz. For click stimulus, in which the mouse is presented with a wide spectrum click (0.1 ms) in decreasing levels between 90 dB and 10 dB, each new stimulus is recorded 5 dB SPL down from the previous. Each point of measurement is recorded and averaged 510 times and analyzed. ABR results can be affected by other electronics in the sound-proof chamber - turn off extraneous transmitting electronic devices in the chamber, and ensure that the heating pad under the mouse is non-electric. Animal temperature - monitor the body temperature with a rectal probe throughout recording and keep the mouse’s body temperature warm using a heating pad (Gold et al., 1985). Continue recording ABR until waveforms are clearly no longer present. If the middle ear, cochlea or brainstem is not functioning properly, waveforms will not be recorded (Figure 3 shows a sample of ABR waveforms from a wild-type (normal) and deaf mouse). The median ABR threshold in wild-type mice can vary depending on the system (TDT or Harvard Apparatus) and the method (close or free field) used to collect it. In general the ABR thresholds are ~ 30 ± 5 dB SPL. Figure 3. Representative ABR tracings from wild-type and deaf mice. Wild-type mice present normal ABR waveforms, while the deaf mice present no identifiable ABR responses. ‘‘I-V’’ indicates the location of ABR peaks. The black arrow indicates the ABR threshold (33dB SPL). Read the result and determine the ABR threshold value, or the lowest level an identifiable waveform can be seen. The threshold can be determined by watching the first 5 peaks. All five peaks should be seen within the first 10 milliseconds. The ABR threshold is determined as the lowest recognizable ABR response (Figure 3: Black arrow). Save the resulting waveforms for future reference and analysis. When recording frequency-specific ABRs, three frequencies are classically tested to examine the degree to which regions of the cochlea are functioning (corresponding to base, mid-turn and apex), though in principle any specific frequency can be measured. Tone burst stimuli of 3 single frequencies (1 ms), including 8 kHz, 16 kHz, and 32 kHz are presented in decreasing levels between 90 dB and 10 dB. Each new stimulus is recorded 5 dB SPL down from the previous presentation. Each point of measurement is recorded and averaged 1,000 times and analyzed. ABR threshold is determined as the lowest recognizable ABR response similar to what it was described above. In general a mouse will remain under anesthesia for ~30-40 min after the first anesthetic injection. Due to the duration of click and frequency-specific ABR recordings (~40 min), one fifth of the original dose of the anesthetic should be injected at around 20 min to avoid the likelihood of the mouse waking up during the testing. If a mouse starts moving, the ABR recording will be disrupted and the mouse must be re-anesthetized with one fifth of the original anesthetic dose. When finished recording, carefully remove the electrode from the mouse. When all the tests are finished, dip the electrodes in Providone-iodine solution for about an hour; rinse with 70% ethanol then cap them and place them in a sterile container. Clean the recording chamber and all surfaces that were in contact with mice with 70% ethanol. Place the mouse in an empty and clean preheated cage during emergence from anesthesia. Do not leave mice unattended until they are fully recovered. Place this cage on a heating pad to maintain the mouse’s body temperature until total recovery from the anesthesia has occurred. Note: Multiple mice of the same group can be placed in the same cage (no more than 5 mice). Return mice to their original cage without heating pad only if they can return themselves to their feet after being placed on their backs. Figure 4. Representative graph of an ABR testing. ABR thresholds (decibels of sound pressure level, dBSPL) were measured in mice with normal ABR (Black, Blue and Green curves) and abnormal ABR (Red curve). 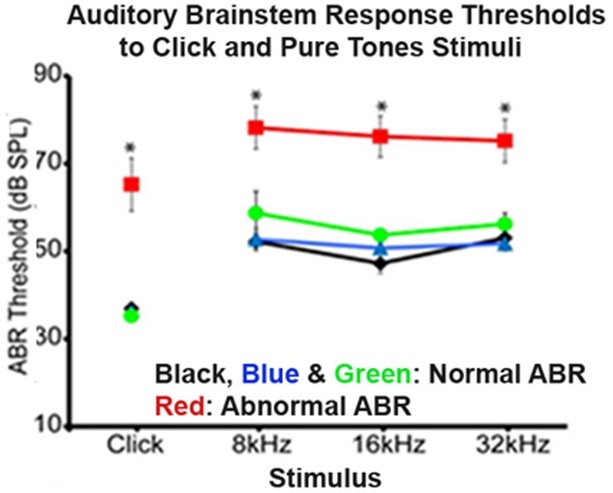 The mice with abnormal ABR showed higher ABR thresholds at click stimulus and at tones stimuli (8, 16, and 32 kHz) when compared to mice with normal ABR. Mix well and place in a rubber sealed vial. The solution of ketamine and xylazine can be used as long as the ketamine or xylazine are not expired and are sterile. The solution should be stored at 4 °C when it is not in use and at room temperature when it is in use. The authors would like to acknowledge the financial support provided by Hearing Research Inc (HRI) and by NIH (NIDCD) Grant #R01DC0130671. Akil, O., Chang, J., Hiel, H., Kong, J. H., Yi, E., Glowatzki, E. and Lustig, L. R. (2006). 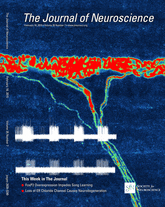 Progressive deafness and altered cochlear innervation in knock-out mice lacking prosaposin. J Neurosci 26(50): 13076-13088. Burkard, R. F., Eggermont, J. J. and Manuel, D. (eds). (2007). Auditory evoked potentials: basic principles and clinical application. Lippincott Williams & Wilkins, Philadelphi. Gold, S., Cahani, M., Sohmer, H., Horowitz, M. and Shahar, A. (1985). Effects of body temperature elevation on auditory nerve-brain-stem evoked responses and EEGs in rats. Electroencephalogr Clin Neurophysiol 60(2): 146-153. Zhou, X., Jen, P. H., Seburn, K. L., Frankel, W. N. and Zheng, Q. Y. (2006). Auditory brainstem responses in 10 inbred strains of mice. Brain Res 1091(1): 16-26.